If you're anything like me, when you think of the "Hippie" Porsche you most likely think of Martini Racing's "Psychedelic" 917 LH. 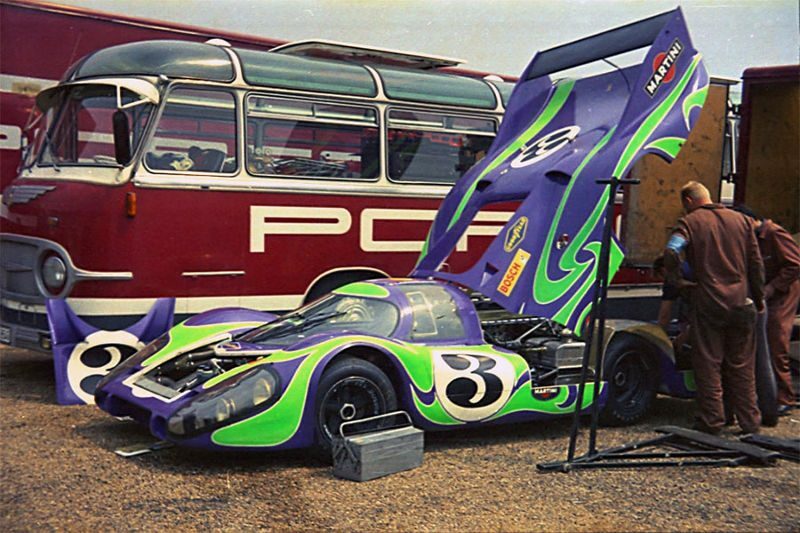 That famous purple, green and white livery was first presented to the pubic in 1970 at Le Mans where Gérard Larrousse and Willi Kauhsenthe piloted it to 2nd place overall (bookended by two other Porsches: the 917 of Hans Hermann and Richard Attwood that gave Porsche their first Le Mans victory and Martini's 908 that took 3rd and swept the podium for Porsche). However, there was a 2nd "Hippie" Porsche in 1970, a 911 ST. It's that 911 that's the subject of today's film. Gérard Larrousse, the same man who drove the famous "Hippie" Porsche 917 to 2nd place at Le Mans in 1970, was additionally tasked with driving this smaller and lighter version 911 ST in the Tour de France that same year. Finishing in 3rd place, the Hippie 911 ST was the first Porsche across the finish line behind the much more powerful Matras. At only 780 kilos (1720 lbs) this is the lightest factory built 911 racecar ever built by Porsche and recently came out of a 5-year restoration by Historika. In this film Larrousse, is reunited with the Porsche 47-years later and we discover that it holds a special place in his heart - and not just because of the race. Update: We had titled this post incorrectly in a previous version. It has now been corrected to reflect the fact that this is the lightest 911 race car ever built by the Porsche factory. The lightest race car built by Porsche is, we believe, the 909 Bergspyder. Correct. The 909 weighed 385 kg (849 lb). Rob, you are both right. When we first researched this story we found some info that stated otherwise. However, the page and source we found have been taken down. What the title should have said is that this is the “lightest 911 factory race car built by Porsche”. The only thing that this video lacks at the end is Gerard Larrousse posing with his son, who was born as Larrousse was racing the car. He did say, after all, that when he sees the car he thinks of his son (5:10). Nevertheless, this is a beautiful story, well told and well shot! Amazing. I remember seeing this car on stage at the Tour de France. Larrousse was my hero then. I was 14. And I got the Porsche bug since. Thank you for the memory film.